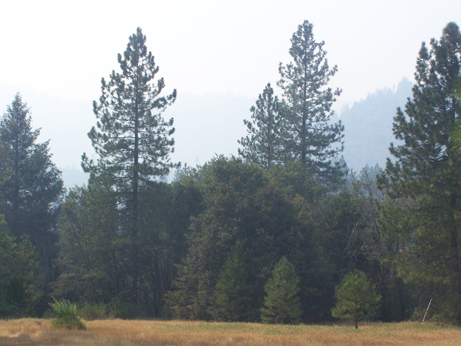 Thursday afternoon, James and I returned to The Woods from a two-day stint in the Bay area. I played Principal horn in a backup orchestra for Canadian jazz singer/pianist Diana Krall, at Davies Symphony Hall in San Francisco. It was one concert only, on Wednesday night. I was pleasantly surprised to see that the auditorium was packed, starting at $75 a seat. The audience was extremely enthusiastic and Ms. Krall put on a good show. “WHAT recession?” I thought to myself. It seems that Broadway-style shows and jazz/pop/rock entertainments aren’t as adversely affected by the current economic downturn as traditional symphony orchestras and opera companies are this year. People are still willing to pay for popular entertainment in challenging times, taking them away from their financial woes for a few hours. The orchestra consisted of forty freelance musicians from around the Bay area. I had played with several of them in the recent production of “Spamalot” at the Golden Gate Theatre. In fact, the same contractor hired for both gigs. The stage was set up in a series of risers in a horseshoe surrounding Diana Krall’s band, a trio of very fine musicians: drums, bass, and guitar joined by Ms. Krall’s piano. I was on the second-highest riser on the right-hand side of the stage, as seen from the audience. In fact, I was on the edge of my riser closest to the people, with the rest of the French horn section further away to my right. The higher riser behind me contained the other members of the brass section: two trombones (one of whom doubled on tuba for several numbers) and three trumpets. The riser below me had the six woodwind players, clarinets and flutes. On the opposite side of the horseshoe were the strings, banked on all three tiers. It was very visually effective, all those pretty violinists (yes, mostly young women) bowing and swaying to the music together. It was a glitzy Lawrence Welk moment. Or a Vegas one. Neutral dark grey curtains served as a backdrop to the orchestra. Spotlights splashed through various colors and patterns onto the fabric to provide further visual interest. Each musician had a light on his/her stand, which was essential for being able to read the music in the dimly-lit, mellow atmosphere of this jazz concert. There was a pleasing variety of music, with Diana Krall’s occasional solo piano accompanying her sultry voice; several upbeat numbers with the jazz trio, and then the big orchestral numbers with us. Our pieces were generally understated and muted, with very long, quiet notes. Nothing “fortissimo” except for a very occasional swelling of chords, but always lower in volume than Ms. Krall’s vocals. The musicians’ performance attire was all-black. Along with black pants and shirt, I wore a black suit jacket and black tie. (Most of the other men wore jackets but no tie.) I’d never worn this particular combination in my “performance uniform” before, and I dare say that it was spiffy! I’ll probably do it again for special occasions in the show pit — which always calls for black — such as Opening Night or perhaps even on a Saturday night. After several encores and standing ovations, Diana Krall and her band bowed one last time, acknowledged the orchestra by calling us ‘supremely talented artists’, and left the stage. It was just after 10 p.m., and I wended my way backstage through a narrow, curved hallway lined with shelves, where the San Francisco Symphony violinists usually put their cases during the orchestra’s performances. In fact, it is called “The Violin Den”. During this concert, all of the musicians hired for the Krall gig put their instrument cases there. After packing up my horn and strapping it to my back, I walked a few blocks down always-colorful Market St. to the BART station at Civic Center, where I caught a late night train to Lafayette in the East bay. James and I stay at my friend R.A.’s house whenever we’re in the area for only a few days; it’s too much trouble to bring the Airstream down for only a one-day gig. We’ve been back in The Woods for three days now. It’s a completely different world; peaceful, quiet and remote. 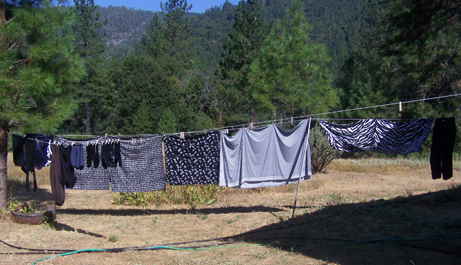 James has done several loads of laundry in the washer in the barn, and hung the clothes on the line to dry. 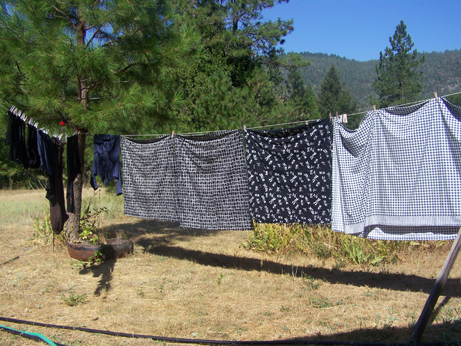 The smell of sun-dried clothes is wonderful! We wouldn’t be hanging up clothes today, however. The sky is covered with a thick haze of smoke from fires burning less than 60 miles due west of us. Apparently one of the several fires was caused by a “bird on a wire”, literally. The air is too toxic to breathe today, so we are spending it indoors. I am back to practicing horn on my own, without the benefit of keeping in shape by playing in an ensemble. It is much more challenging to keep up my chops, so to speak, by myself. It is also a challenge to be unemployed. On one hand it’s nice to have a break, but I always feel more useful and productive when I’m playing the horn professionally. Here in The Woods, I do not earn any money this way. So I feel rather disconnected from this area, this community. For me, it’s more of a vacation home at the moment. I know that this will change in the future when I’m “retired” and won’t be schlepping to the Bay area for gigs, but that time has not arrived yet. I have a few more years of good playing left, and I intend to make the most of it. I am just now working my way into the freelance music scene in the San Francisco area — something I’ve always thought of doing — and now it’s actually happening! I’m gradually getting more employment as I make more musical connections. I’m learning how to deal with the ins and outs of the freelance scene, which requires tact and diplomacy, as well as a certain skill in wending one’s way through the minefields. The day after we got back home, James wired a 30-amp RV plug into our breaker box so that we can run the air conditioning in the Airstream. Our first A/C in the Woods! I’m so proud of him. 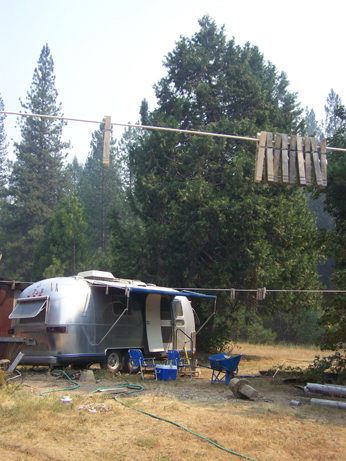 We moved the trailer from the front of the barn to the back, where there is more privacy and shade in the afternoon, and a view of the meadow to the west. It feels right there. My next gig in the Bay area is in the middle of September. Until then, we shall enjoy our time here in The Woods. So James & I continue to live a double life. It has its advantages and disadvantages, but mostly it is good.